I don’t live in Wrecsam. I don’t even live close to Wrecsam. Heck, I don’t think I even visit Wrecsam more than once every couple of years (even though I have some genuinely excellent friends over in that part of the world). So why have I stuck my hand in my metaphorical pocket and forked out my bank account details to pledge £10 a month to keep the Welsh language, community centre and pub Saith Seren open? First and foremost, I have a huge amount of respect for the small crew of volunteers who have worked their guts out over the last three and a half years. It was a hugely ambitious idea – and they went for it, and they made it happen. They’ve put absurd amounts of time, and painful amounts of their own money, into this superb and glorious dream – and they do not deserve to see it fail. And they don’t have to see it fail. Our learners responded with immediate strength of feeling when they heard that Saith Seren was set to close – and that strength of feeling has now been echoed in the wider community. We don’t have much time, but we DO have what it takes to win this. I don’t know of anywhere else quite like Saith Seren, with the exception of Canolfan Tŷ Tawe down in Abertawe. This is exactly the kind of project we need to see happening in Wales – it makes the language lively and accessible, it strengthens local communities, and it stands against the hugely damaging loss of trade from our town centres. I believe sincerely that Saith Seren is a model for the whole of Wales, and if we can keep it alive over this short-term hurdle, it will be able to take this wave of membership support and turn it into something hugely sustainable and successful. 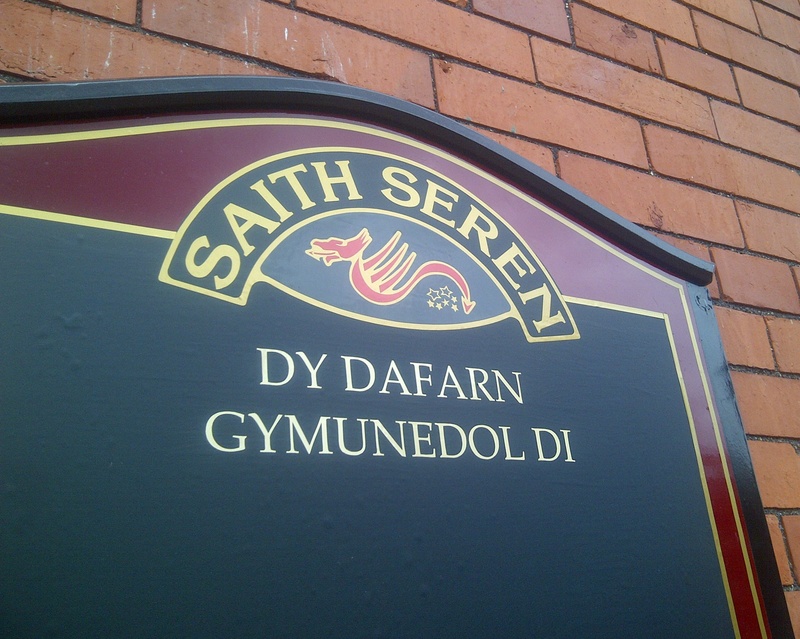 Saith Seren is also genuinely important for the Welsh language. Many activists focus (rightly and properly) on what needs to be done in the Welsh-speaking areas, in the Fro Gymraeg – but we also need to have the confidence to reach out in areas where Welsh isn’t the obvious community language. What’s more, we need to do that in a positive and confident way – in a manner similar to how Basque language campaigners have taken such a central rôle in the entertainment industry in the north of Basque Country. If we lose Saith Seren, I’m not sure where the next attempt to do that comes from. One of the most striking results of a project like Saith Seren is that it becomes possible for local people who don’t speak Welsh to show their support for the language. It can happen in a lot of different ways – people can (and d0) start to say ‘Diolch’ and ‘Sh’mae’ when they’re in Saith Seren, even if they don’t have any more Welsh than that – and they can become used to hearing Welsh around them as a part, as a valuable part, of their own community. What’s more, it can even let people who’ve always spoken English with each other realise that they both speak Welsh – this has happened to friends of mine in Saith Seren. Reaching out, welcoming, celebrating – these are vital parts of building a real future for the language. We live in tempestuous times. The financial crisis has given right-wing politicians the perfect excuse to cut spending on all sorts of genuinely important parts of our society, and while it’s great to see alternatives to austerity getting serious coverage, it would be foolish to leave what we hold dear to the mercies of government. We need to rediscover the community spirit that lead to such proliferation of schools and chapels in even the ‘poorest’ communities of Wales a hundred years ago and more. We need to realise that we can take matters into our own hands – we don’t have to wait for grants, or beg governments to change the law – we can just see what needs to be done and work together to do it. If we really learn that lesson, there’ll be no stopping us. If we can save Saith Seren, it’ll be an important sign for all of us that we can achieve great things. So that’s why I’ve pledged my £10. We don’t have much time left. The Board have to make their decision on the 12th of May. But it’s still winnable, and by God it’s worth doing.